Quantitative structure–property relationship (QSPR) modeling is generally used to develop in silico prediction models of skin permeability based on the compound molecular structures. 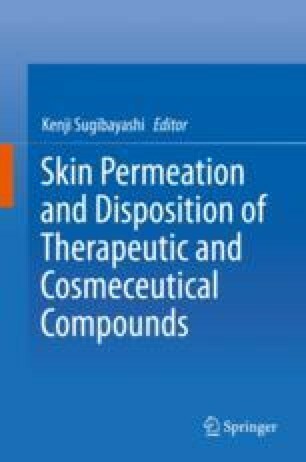 Due to the improved quality and size of permeability datasets and the use of promising machine learning techniques, appropriate molecular descriptors, and model validation, current QSPR models provide a highly reliable and efficient option for assessing skin permeability of numerous candidate compounds for use in dermatological medicines and cosmetics. While computational models can predict skin permeability of even yet-to-be synthesized or virtually generated compounds, the traditional prediction models have been limited to only evaluating the skin permeability of permeants in aqueous solutions. Such models cannot evaluate the effects of solvents on skin permeability that constitute a crucial problem for the optimization of topical formulations’ compositions. This has motivated the recent development of models that can predict even the complicated solvent effects on skin permeability with quantitative accuracy. Here, we introduce the general procedures of QSPR modeling for predicting skin permeability and review the existing models including the newest models that can predict solvent effects on skin permeability.